For many years now, El Querandí has been proud to have the best and most complete tango restaurant in Buenos Aires. We have a wide gastronomic offer, featuring the typical dishes that compose varied geography of our beautiful country. This cuisine is combined with a splendid tango show, truly unique, capable of transforming your evening into a truly unforgettable experience. We invite you to enjoy an exquisite a la carte dinner, with more than twenty regional dishes that precede the tango show, where musicians, dancers and singers invite us to pay homage to the essence of Buenos Aires nightlife. The menu consists of three steps: starter, main course and dessert; and includes soft drinks, beer, wine, coffee and/or tea. 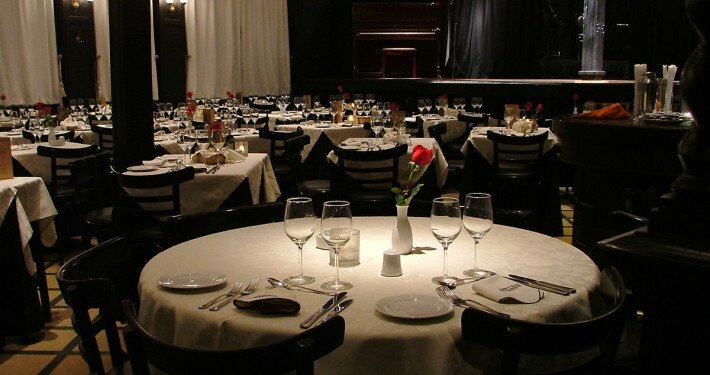 For all these reasons, El Querandí is widely recognized around the world as the best tango restaurant in Buenos Aires: an extraordinary and mythical place, precisely because it manages to perpetuate the magic of the ancient tango parlors and milongas of the city in our times, adding to it the possibility of tasting the tastiest regional dishes of our country. Tango is undoubtedly the most felt and authentic expression of Rio de la Plata’s culture, capable of expressing intensely the passion, melancholy and nostalgia of the city. In this context, El Querandí’s proposal seeks to honor this glorious past, but also to keep it alive every night, every dish, every chord, every measure; and this is achieved by making each evening indelibly imprinted in the memory of all our guests.